Operating our filtration facility at the Green River. Maintaining 24 wells to supplement water needs, mainly during summer demands. Protecting thousands of acres in the Green River Watershed. Upgrading and maintaining 1,376 miles of water main infrastructure. 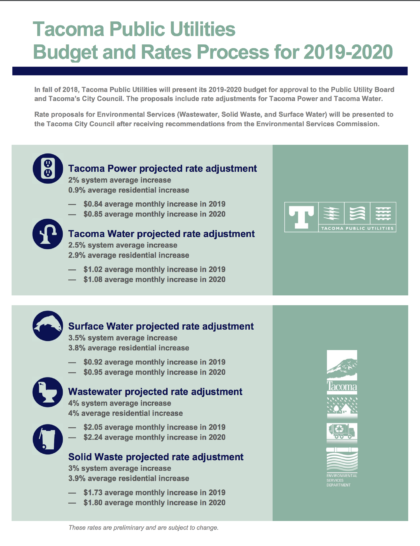 As Tacoma Public Utilities adjusts rates, we understand that decisions we make will impact you. We take that responsibility seriously and look for ways to manage costs effectively, while still delivering the quality of service you expect by maintaining and improving our system. You may only see us in the water you turn on or in the electricity when you flip a switch, but we see you in everything we do. You are the vital link to these services and the ability we have to provide them. For 125 years, your support has shaped this community, our region’s natural resources and our organization in ways you may have never realized when you pay your utility bill. The Tacoma Power rate adjustment goes into effect April 1, 2019. Tacoma Public Utilities staff hosted several outreach events to provide an opportunity for members of the community to learn more about how the budget process works and hear about rate adjustments before they go into effect. Click here to view a list of events and view the presentation documents. We have developed a one sheet to help break down the projected rate adjustments. Use the links below to access this handout in six different languages. Tacoma Public Utilities offers a variety of payment options, services and programs to help make paying your utility bill more manageable. We also offer free online resources that provide tools and tips for lowering your power and water bills. Residential customers who have had service for at least 12 months may enroll in Budget Billing. You pay the same amount for your utilities each month. On the 12th month, your budget billing amount will be recalculated for the next 12 months. This allows you to accurately plan for and create a budget for your utility expenses. Our conservation programs offer many ways to reduce your electric and water use, from instant discounts at retail stores on LED bulbs, to energy and water saving showerheads and aerators, to rebates and contractor resources for insulation, windows, heat pump water heaters, and ductless heat pumps. Learn more about our residential conservation programs. No matter what type of business you own or manage, we have ways to reduce your electric and water use. We offer rebates and incentives on energy-saving lighting retrofits, HVAC system upgrades and compressed air efficiency projects, to name a few. We also offer free energy audits and energy bill profiles, as well as zero-interest loans. Learn more by checking out our commercial conservation programs. Income-qualified customers may be eligible to receive a grant that could cover a majority of the costs of energy efficiency improvements to their residence. Depending on the program, both home owners and tenants (with owner approval) may apply. Tacoma Power also offers zero-interest loans to qualifying home, property and business owners.